If you’re like many women, your lashes are light and, without makeup, they seem to just disappear. The solution for most is mascara, which we painstakingly apply every morning, spend all day trying to avoid the smudges, and reapply before going out at night. If this sounds like your day, then eyelash extensions may be the perfect solution for you. Lash extensions are a semi-permanent solution that, as the name implies, extends the length of your lashes. Because they are thick and dark, they are more visible than your natural lashes, giving you the look of mascara without the hassle. Extensions come in different thicknesses and materials, including synthetic, mink, and silk. The variety allows you to choose a customized look with as much volume as you’d like. It’s best to consult with your professional makeup artist about how thick you can go, because this varies by the strength and thickness of your natural lashes. 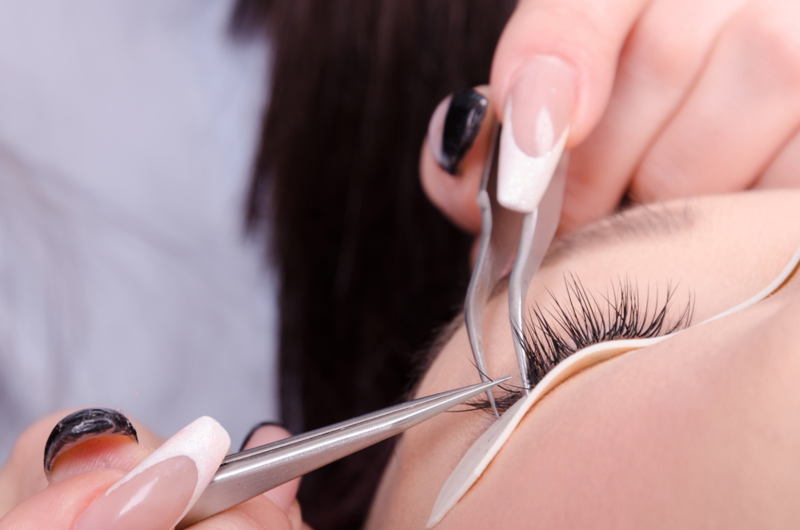 The process can take about two hours, since each extension is applied to one of your natural lashes. During the procedure your eyes are closed, and a special, safe adhesive is used to apply the lashes. If you tend to be extremely sensitive to makeup products, tell your makeup artist that you need to test the adhesive first. For most people, the adhesive is mild and non-irritating. Lash extensions last for two weeks or longer, then fall off with your natural eyelash growth cycle. You can keep having them applied to be mascara-free year-round. After the procedure, it’s usually recommended to keep them dry for the next 24 hours to let the adhesive fully set. Your makeup artist will instruct you on how long to wait and whether any aftercare is needed. In most cases, there is no special care needed to keep your extensions looking gorgeous. Eyelash extensions are a great option to enhance your eyes without the hassle of applying mascara regularly. If you’d like to give them a try, make an appointment today at Meraki Hair & Makeup Studio. Our professional makeup artists will help you choose the Xtreme Lashes look that’s right for you. You can find us at 1281 Arthur Kill Road in Staten Island or call 718.966.6601. Prefer to instantly schedule an appointment yourself? Download our free mobile app from iTunes or Google Play.